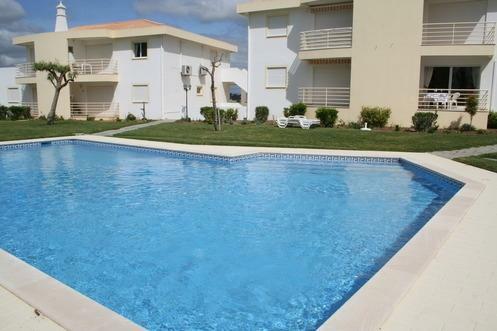 Apartments in Albufeira, Gal� - Property for sale. Full Description: This delightful 2 bedroom apartment, on a small private condominium of only 11 in total, is located very close to Gale beach. With all amenities within walking distance including a variety of bars, restaurants, cafes, supermarkets and of course beaches, the location is ideal for relaxing holidays. For the golfer, Salgados is a 5 minute drive and if you are more nautical, the Marina at Albufeira is a 5 minute drive too where you can participate in many water sports or simply relax with a cold drink whilst admiring the luxury boats. The condominium is completely enclosed and is accessed through remote entry gates. The 11 apartments are in 3 separate blocks and this particular apartment is in the middle block on the ground floor and South facing. Accommodation comprises an entrance hallway with wardrobe storage, fully fitted and equipped kitchen with a full range of appliances, shower room, spacious lounge/dining room with patio doors leading directly out to the South facing sun terrace with built in BBQ and views to the pool and gardens. There are 2 double bedrooms each with fitted wardrobes and windows to the side and pool and also a full family bathroom. The apartment has been beautifully furnished and decorated and if required furniture can be included with the sale. Other benefits are electric shutters, air conditioning in all rooms, double glazed windows and doors and video security entry system. Each apartment has a large remote entry allocated garage space and there is also private guest parking too. Outside the gardens are beautifully landscaped with plenty of space to sunbathe around the pool which is heated in the cooler months. A definite benefit being a small condominium, the administrators are a local company who manage the condominium in a professional an efficient manner and the owners are very involved in any decisions giving a community feel to the place as a whole. Apartments in this area to not come up very often, especially at this price, so early viewing is recommended. Existing rental income is also included. This listing has been viewed 841 times.